(Bali, February 2018) – Samabe Bali Suites & Villas welcomes guests to celebrate the arrival the year of the dog on February 2018 with an array of special festive offering and invites all guests to ring in the new and prosperous year by enjoying special curated authentic dining. Family or friend can spend quality time in the comfort of the hotel. To add more joy, Rempah-Rempah Restaurant at Samabe Bali Suites & Villas is ready to cater all guests in sharing joy and happiness by preparing special culinary delights in honor of the festivity. For guest who is partaking in the celebration, Chinese New Year’s Eve Dinner on 15th February 2018 is available at IDR510,000++ per person. Wide choices of dishes are specially prepared by our experienced culinary team, starting from Seafood BBQ to wide range of sweet tooth dishes. 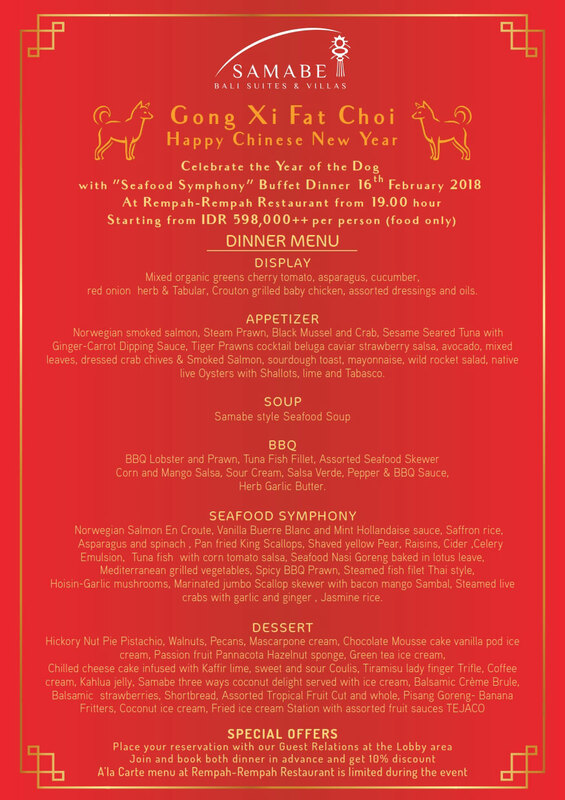 For guest who prefer to enjoy the dinner on 16th January 2018, “Seafood Symphony” celebratory is available at Rempah-Rempah Restaurant to enliven Chinese New Year Day. Is available at IDR598,000++ per person and starting from 19.00 hour. 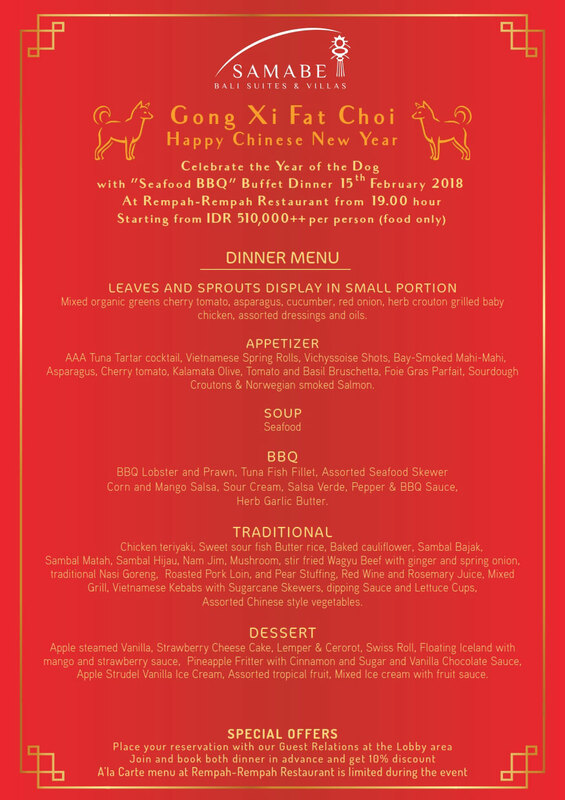 “Inviting all our guests in the festive of Chinese New Year with dining promotion at Rempah-Rempah Restaurant. Offering wide range of tantalizing food, I hope all our guests are enjoying what we have to offer and can create memorable Chinese New Year at Samabe Bali Suites & Villas”, Said Ralf Luthe as General Manager for Samabe Bali Suites & Villas.